A silicone mold and a clay extruder with a core adapter create the elements needed to complete this project. There is a wide range of silicone mold designs to choose from and multiple sizes of tubing that can be created. Pinch off enough metal clay to allow for the dimension of the design you have chosen to work with. 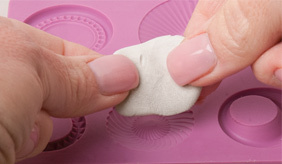 Roll the clay in your hands to form a ball with a smooth surface. Press the clay out until it is about as wide as the design. Press the clay into the mold. Apply a light coating of olive oil to your hands or to a roller. Working with care so the clay doesn’t shift, press on the surface of the clay so it reaches all the details in the mold. Tip: If the clay sticks to your hands or the roller and you press it back down into the mold, you may have a double impression and will need to start over. Flex the mold to release the clay or find a section of the clay that extends past the mold and use it as a tab to lift the clay out of the mold. Check the design to make sure you captured all of the details. Carefully invert the design and place it right side up onto a non-stick sheet. Trim, using a blade or pointed tool. Choose the size circle cutter that closely matches the size of the dichroic cabochon you have selected. 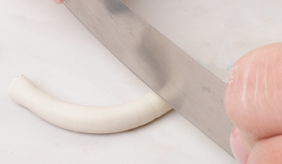 Use the circle cutter to cut out a hole in the clay. Use a damp paintbrush to clean up all edges of the design. 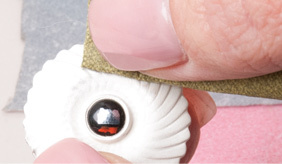 To maintain the opening, put the cabochon in place then set the design aside so the clay can dry thoroughly. Using an extruder fitted with a circle disc and a core adapter, create a tube of clay. This will be used as the bail for the pendant. Trim the tube to fit the back of the design. Allow the clay to dry thoroughly. 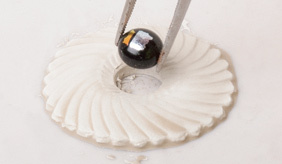 Once the pendant is dry, remove the cabochon. 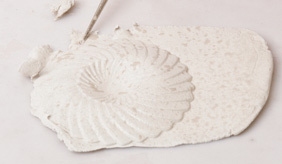 Using the polishing papers from lowest to highest grit, refine all surfaces of the clay. 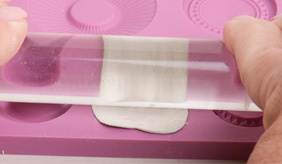 Using the syringe clay, apply a line of clay to the inside of the opening. Put the cabochon in place. 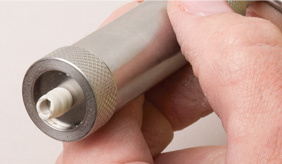 Use the syringe to apply a line of clay around the cabochon, creating a bezel. Allow the clay to dry. Wet the back of the bail and the back of the pendant where the two will be joined. 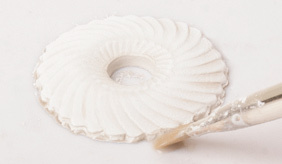 Apply paste or slip to the back of the pendant where the bail will be placed. Press the bail to the paste. Allow the clay to dry. 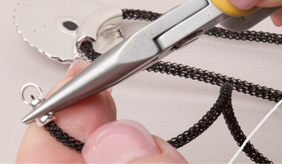 Use additional paste or slip to fill in any gaps or openings between the pendant and the bail. Refine all areas so the pendant and bail are ready for firing. Place the pendant onto pieces of fiber blanket placed onto a kiln shelf. The pendant should rest level so use the fiber blanket as needed. Note: Wear a dust mask when breaking pieces of fiber blanket apart. Fire the kiln at 1200 degrees per hour up to 1200 degrees Fahrenheit. Hold the temperature for one hour then allow the kiln to cool to room temperature without opening the kiln door. Remove the cooled pendant from the kiln. 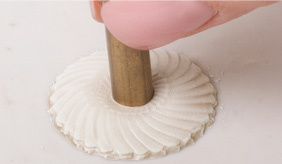 Using a progression of polishing papers from lowest to highest grit, followed by a progression of grits in the micro-mesh polishing pads, buff the surface of the pendant. 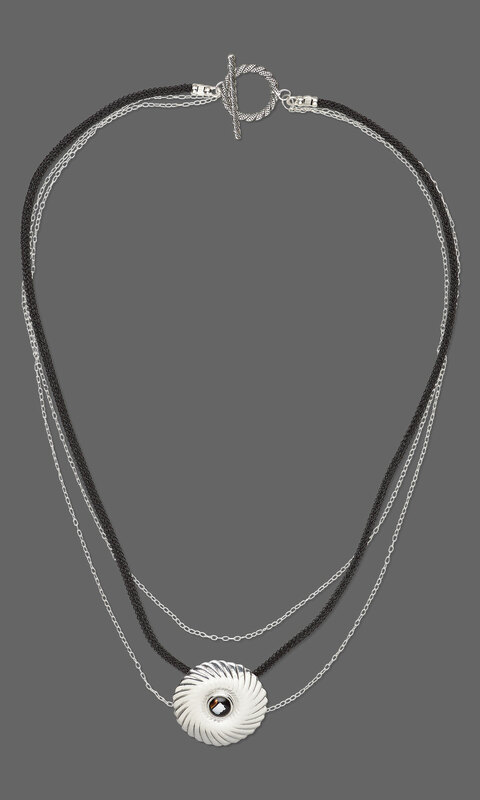 If you would like a higher polish on the pendant, tumble the pendant with steel shot. Thread a 20-inch length of black knitted wire through the bail. 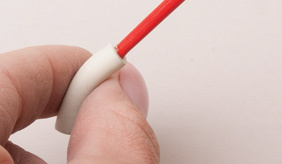 Place a crimp end onto one end of the knitted wire tube. Compress the crimp end so it is secure. Repeat adding a crimp end onto the other end of the knitted wire tube. Open a jumpring. 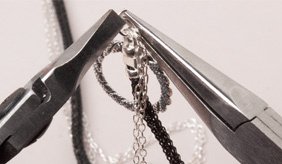 Put onto the jumpring the loop from a crimp end, the last link on one end of the 20-inch length of chain, the last link on one end of the 18-inch length of chain and a loop on one half of the clasp. Close the jumpring. Repeat on the other end of the necklace, capturing the other crimp end loop, the loop on the other half of the toggle clasp, the last link on the other end of the 36-inch length of chain as well as the 18-inch length of chain so the chains are staggered in length.